Living Room, Entry Hall & Library of whole home project on CA coast that included 24 fine 19th century Persian rugs. Oakland, CA — For over thirty years, Jan David Winitz, President and founder of Claremont Rug Company in Oakland, CA, has built a global reputation among carpet collectors and connoisseurs. 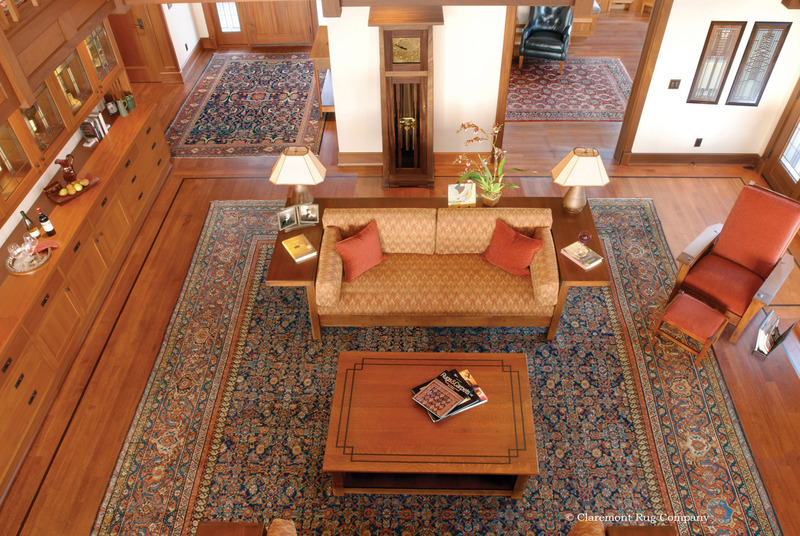 Since Claremont Rug Company opened its doors in 1980, their niche has been a challenging, yet incredibly exciting one – offering only the finest in authentic, art-level antique carpets, coupled with entirely first cabin service. Claremont Rug Company holds a central position on the international market as a “first source” buyer, ambitiously acquiring superlative private collections and significant family estates rich in carpets that will literally enrapture the viewer through their great creative depth and exquisite craftsmanship. Jan David Winitz took some time out from his busy schedule to answer some basic questions about the carpet business. This is the first part of the interview. The second and final part will be published next week. Q: How and when did you get into the field of rugs? A: I actually was introduced to antique Oriental rugs as a child by my grandmother, who was a prolific collector and one of the few women in the field in the mid-20th century. While other children were collecting baseball cards, I was learning about 18th and 19th century rugs and the interest grew over the years. After I graduated from college (University of California, Berkeley), I taught high school English for three years and continued my rug “hobby.” In 1980, when I was 25, I met Christine Hunt, who became my wife and who was also an antique rug collector. We both had a passion for antique Oriental rugs and reached the mutual conclusion that art level rugs would be at the very least our “hobby.” We opened Claremont Rug Company with a vision and, fortunately, what we had seen as a latent interest among art lovers to collect antique rugs was correct. Claremont Rug Company moved quickly from being a sideline to our primary business endeavor. Q: What clicked and made you say, “This is what I want to do the rest of my life”? A: After being introduced to antique Oriental rugs by my grandmother and the many collectors she knew, I came to learn about the culture of the people who created them, and to appreciate the spiritual nature and deep impact of the pieces. From the onset, I believed that antique rugs were an undiscovered art form and I was confident that I could expose the world to them. I was also comfortable that I could use my background in education as part of the way I conduct business. Over the years, I have been privileged to work with many collectors of various forms of art and to educate them about antique Oriental rugs. It has been extremely fulfilling. Q: I imagine there is no school where you can learn about rugs apart from regular art schools, how did you acquire your knowledge? A: First of all, as far as I know, one can’t even go to art schools to learn about Oriental rugs. Instead, you have to read the limited amount of literature devoted to the field. In addition, there are a few museums in the world, including the de Young in San Francisco, the Metropolitan Museum of Art in New York, the Textile Museum in Washington, DC and the Berlin Museum that have extensive collections. We like to believe that our Gallery, with an inventory of 4000 pieces of which 1000 are available for viewing on our website, is also an important resource for honing one’s eye for great antique rugs. Overall, as with most areas of interest, the more that you study, read and experience pieces first hand, the more you begin to obtain knowledge and to gain a more seasoned eye. Of course, the exposure to great rug collections through meeting my grandmother’s connoisseur friends before and after her passing catapulted me into this magical art form. For my part, I have been fortunate to talk with descendants of the rug-makers to gain some of the perspective that the actual weavers had. As a gallery owner for the past 32 years, I review “one-in-the-world” antique carpets on a regular basis, yet can still say I learn much every day. I continually find myself seeing something in a rug that I have not seen before. I also have friendships with many collectors and have been lucky enough that my wife shares my interest in antique Oriental rugs. Q: What are the best books about Oriental rugs? A: Two of the best are “Rugs and Carpets of the World” by Ian Bennett and “Oriental Carpets: From the Tents, Cottages and Workshops of Asia” by Jon Thompson. Everything by the early luminary Ulrich Schurmann is superb. I should add I have written a short introductory book near the beginning of my career: “The Guide to Purchasing an Oriental Rug.” Certainly not a “tome” or of the gravitas of others I mentioned, but my clients tell me that it has been quite helpful to orient them to the field. Q: There are a couple of concepts that you have developed, first how did the Whole Home Collections concept come about and can you give a few examples of how you tackle decorating an entire home? A: From the very beginning of the Gallery, I have communicated with my clients about the intrinsic artistic and cultural importance of antique Oriental carpets. At the same time, they are an art form for floor display and most clients use them in this traditional manner in their homes. As a result, decorating with them has most often been the starting point for a rug collection. Clients who had lovely homes and fell in love with their great beauty often experienced that a room without an art-level rug seemed to be missing something. So creating “whole home projects” grew out of my clients’ natural extension of appreciating and displaying rugs. Antique Oriental rugs have that rare ability to enhance many different decorating styles. I understood early on that art-level antique rugs serve stunningly as unifiers to other forms of art. They add tremendous warmth and distinction to a room, and have a great unifying effect on a home, which otherwise might seem simply an accumulation of art and antiques. Q: The second concept, on how you elevated the status of rugs from decorative to art level, can you please explain how this happened through time?